Think a Good Background Check Costs too Much? Think Again! think they are just too expensive. This is especially true of new small businesses. As an entrepreneur, your funds are often pulled in all different directions. You may have payroll obligations, basic business costs (utilities, supplies, etc.) ~ the list can seem endless. And of course getting a paycheck yourself would be nice. However, it is possible for you to get a good employment background check that fits in your budget...if you do it right! There are a lot of different kind of background checks out there with varying costs attached. It is possible to do anything from a quick internet search to hiring a screening company ~ and even those companies charge differently. And if you look at all the services offered, your cost can add up quickly. This is where many companies, especially small businesses, fall into a dangerous trap. Since cost is an obvious concern, it is tempting to simply look for the cheapest option you can find. 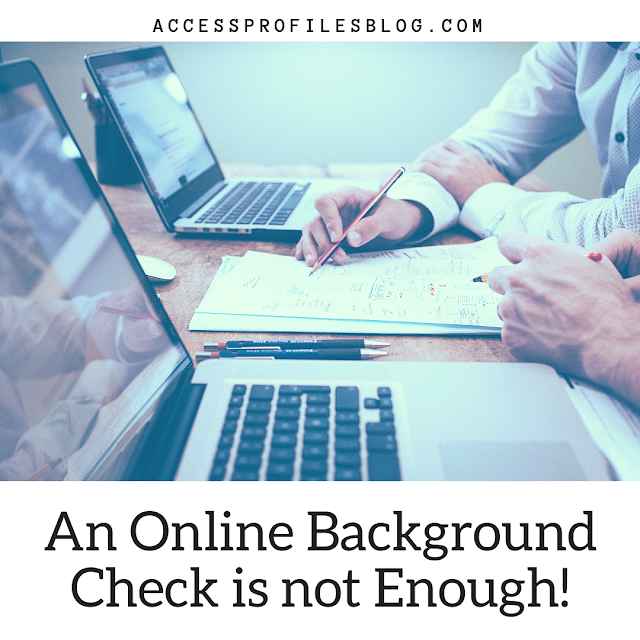 Many believe that option can be found in the “instant” background checks offered by numerous online companies. Many charge less than $20 for what they claim is a “national” criminal search. What could be better? It fits in your budget and covers all the criminal records you would need. The truth is, there is simply no such thing as a “national criminal check”. No national repository exists. There is not one location where all the criminal records on each and every person are housed. There is also no additional verification through the individual local, county, and state courts with this kind of check. This can lead to inaccurate results. Therefore, relying on this information for making your hiring decisions is unwise. You can find more about this in “Background Checks and Online Databases ~ What You Need to Know”. Instead, it is important to understand what sources really should be used for gathering the best information ~ and the most reliable records are those found directly through the courts. 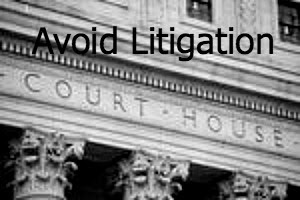 Most often this starts at the county level (although state, federal, and sometimes magistrate level courts are frequently checked). It is best practice to investigate the courts in each county where the applicant lived, worked, or gone to school for at least the past 7 years. This may seem like overkill when you are worried about your company’s bottom line. However, it is possible to get accurate and reliable information that is still within your budget. 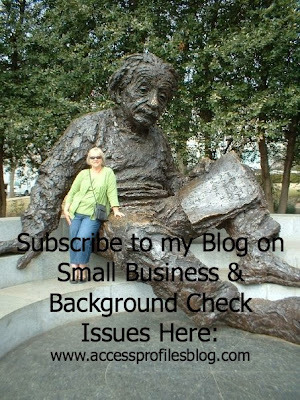 The key is to find a background check company that specializes in small business. You will find that they are focused on finding a way to balance your budget with your hiring needs ~ without sacrificing quality. 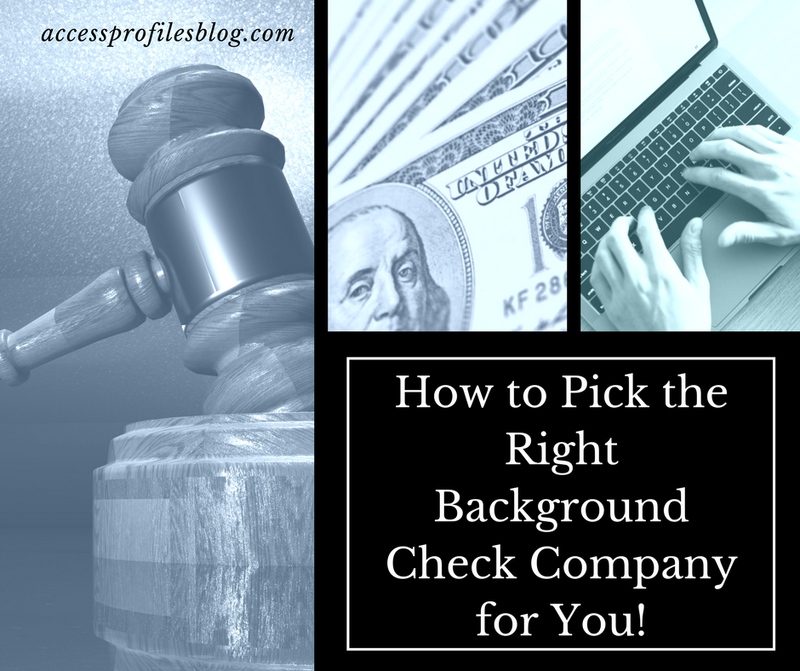 You will find tips to help in Choosing the Right Background Check Company for You here. First and foremost, they will listen to you before recommending the right scope for your background check. They will not try to sell you on screening services you don’t need. 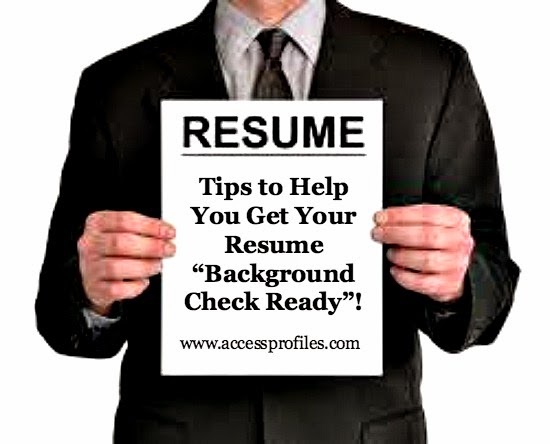 A good background check company knows that the best way to accomplish this is to fit the background check to the job. This starts with examining the job description. For example, if you are looking to fill an entry level or hourly position, the right background check company will suggest you choose a basic criminal search of the appropriate county(s). Many county criminal court checks can be done for around $20. This should fall within your budget, and there are times that this alone may be just what you need. However, if an upper level position needs filled, then a more in-depth check would be recommended. 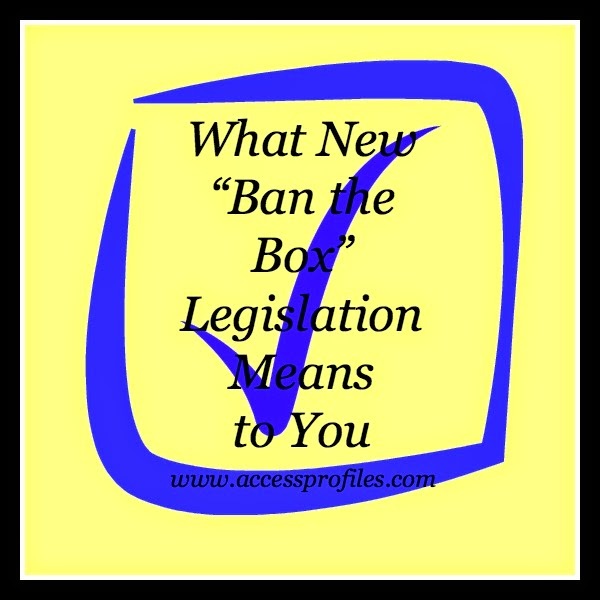 Read more about this in “One Size Does Not Fit All ~ Why You Need to Fit the Background Check to the Job”. while still giving you quality results. A good background check company understands this. 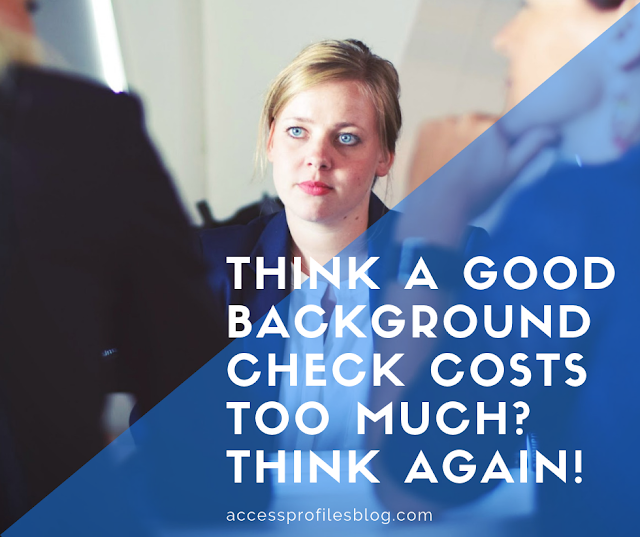 What you also need to remember is that the cost of a “bad hire” will far outweigh the costs of a good background check. According to a Careerbuilder.com survey, “More than half of employers in each of the ten largest world economies said that a bad hire has negatively impacted their business”. And, among those U.S. companies having had a bad hire, “27 percent reported a single bad hire cost more than $50,000” (Source1). The survey cites the negative impacts of a bad hire as “lost productivity”, declining “employee morale”, worsened “client relations”, “fewer sales”, and additional “cost to recruit and train another worker”. When making a bad hire, there is also the possibility of opening your company to a potential negligent hiring lawsuit. All of these effects can harm your company far more than the cost of your initial background check. A Good Small Business Background Check Doesn't Have to Break the Bank! "Tweet This"
So don’t think that a good background check is out of reach. You can get the quality information you need within your budget. 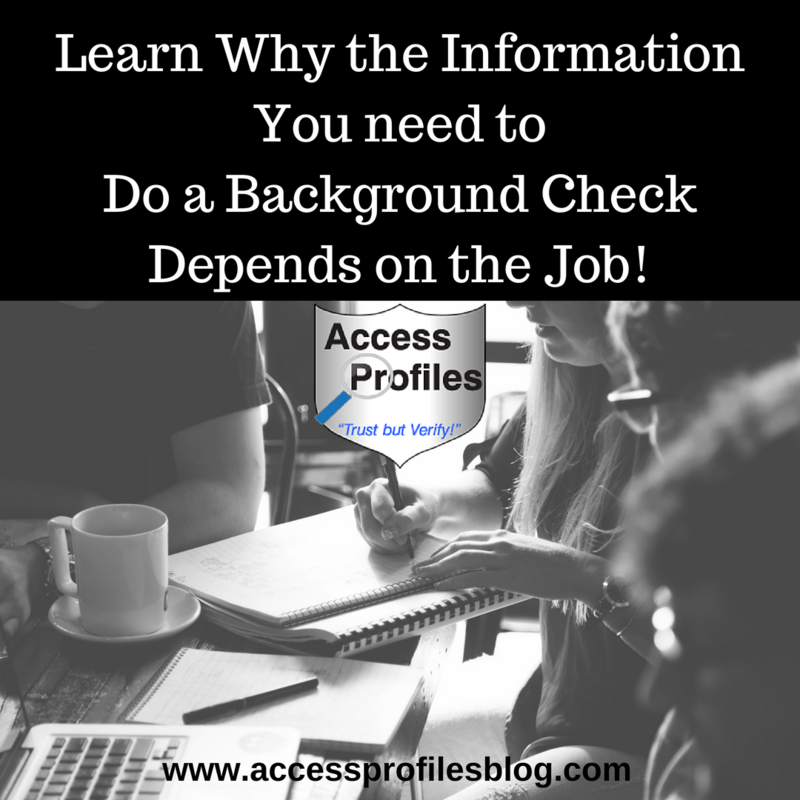 All you need is a good background check company to help! So remember, while it is important for you to watch your small business budget, there is no need to eliminate using background checks to do it. We are here to talk with you about your specific company needs. About Us and our Hiring, Business Mentoring, and Security Consulting services too! 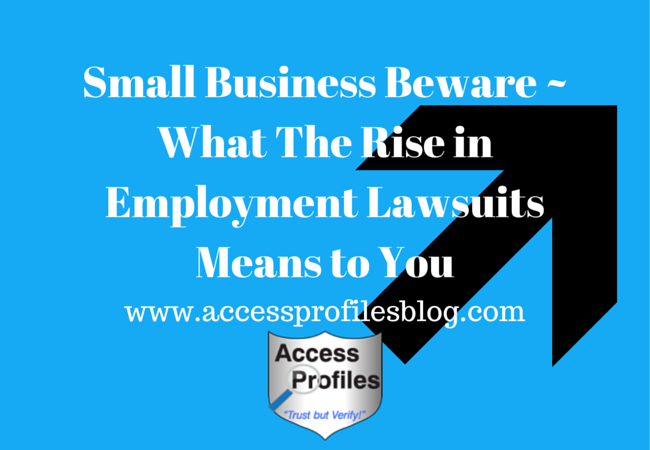 According to a recent article, the class action lawsuits alleging employment (Background Check) violations tripled in 2014! “Watch Your Back: the Growing Threat of FCRA Background Check Class Actions”, Foley & Lardner LLP, Gregory D. Snell. The rise in these cases can partly be attributed to favorable settlements (from $2 million to $7 million) and to continued confusion over the technical aspects of EEOC compliance with regard to Background Checks. It is important that you understand what triggers an EEOC lawsuit and what you can do to make sure you are not in violation. 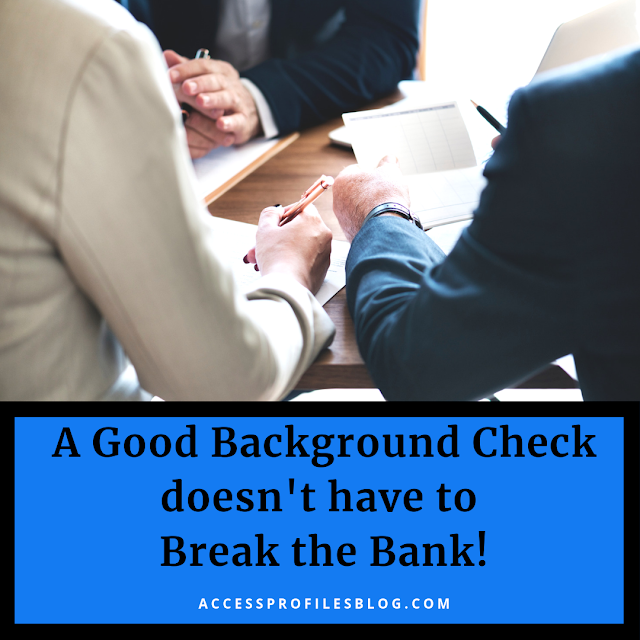 A big red flag is the perception that your use of criminal and credit checks during hiring create a “disparate impact” on minority candidates. However, there are those who are willing to push back on the EEOC regarding the validity of their guidelines. In “State of Texas v. EEOC, Case No. 5:13-CV-255 (N.D. Tex. Aug. 20, 2014)”, Texas attempted to make a pre-emptive strike against the EEOC’s guidance on using criminal and credit history during hiring. Texas argued that that it interfered with existing TX laws that prohibit the hiring of felons for specific jobs. This case was dismissed on the grounds that, up to this time, there has been no action taken by the EEOC to enforce the guidance. The court ruled that the suit was “mere speculation” and, therefore, there is no standing to file the claim. Texas has filed an appeal on the basis that the EEOC guidance on this issue illustrates a direct threat to state law. Either way, the outcome of this case could impact future claims from states with similar laws restricting the hiring of felons for certain positions. they were not always successful in their quest. One such case, “EEOC v. BMW Manufacturing Co., LLC, Case No. 13-CV-1583, 2014 US District. LEXIS 169849 (D.S.C. Dec. 2, 2014)”, is an example. The EEOC claimed that BMW’s criminal background check policy created a “disparate impact” on minorities. They also stated that convictions that were not job-related or necessary to protect the business were used in making hiring decisions. BMW countered with a request for the EEOC’s own policies concerning the use of background checks in their hiring practices. As discovered in a previously argued case (EEOC v. Kaplan Higher Education Corp.), the EEOC does in fact use both criminal and credit histories to determine employment within their own company. This will most likely continue to haunt the EEOC in their quest to charge employers with this offense. However, despite outcomes both for and against those that challenge the EEOC, the trend of increased litigation is something to beware of on into 2015. What is important to know is that there are ways to protect yourself and your company. My belief is that “Forewarned is Forearmed”. Understanding that the EEOC is driven to continue its pursuit of companies who they believe are negligent in their hiring practices is key. Because of this, it is important that you make sure you are compliant with all applicable state and federal employment laws pertaining to your business. Violations that most commonly garner notice from the EEOC are those involving the background check release form. The absence of a “stand alone” form and/or a misleading form are often cited. The #1 thing you need to do in 2015 is review your release form and take all steps necessary to make sure it is compliant. I cover this in my article, “Tips to Help Your Business Fly Under the EEOC Radar”. In addition, your best defense is to make sure that all employee documents you have on file put you in the best position to defend yourself against any possible lawsuits. Job Descriptions ~ A thorough description of each position within your company, including education/skills required, job duties, etc. Employment Documents ~ these include completed applications and resumes, signed release forms, Background check results, documentation of employee rights notices, notices of adverse action, and any notes pertaining to what decisions concerning an offer of employment were made and when. Performance Evaluations and Disciplinary Warnings ~ a written documentation of each employee’s performance evaluations, including any warnings and/or counseling given (extremely valuable if an employee is let go for “cause”). Be sure to cite all dates and times of each evaluation. Now is the time to take a look at your hiring practices and fix anything that is not up to par. I can help you get and keep your company compliant. I invite you to Subscribe to my blog, for more articles dedicated to helping you solve the problems that come with running your Small Business! 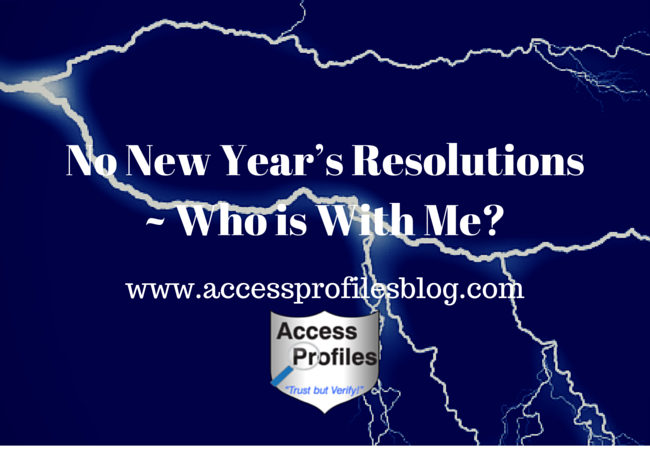 No New Year’s Resolutions ~ Who is With Me? It has been a wonderful holiday and, truthfully, I am still celebrating! I was able to take time to truly enjoy my family and friends ~ what more could you ask? But, as it often is with the start of any new year, many people are talking about making their “new year’s resolutions”. They are discussing what they will be working on; losing weight (doesn’t that seem to be a perpetual goal for many), working on any number of other self-improvement goals, and even making resolutions for our professional lives and businesses. While I applaud the desire to make positive changes through our resolutions, I am here to say that I will not be making any. Now is NOT the Time to Make Your Resolutions! "Tweet This"
I have to do what is right for me. I guess you could say this is a resolution in itself, but I am opting to look at it as a way to alleviate the pressure of making resolutions right now instead. This is not to say that I don’t believe in the need for reflection, reevaluation and refocusing. I have written before about why I choose the fall instead as the time of year when I make decisions about what course I am taking. It is simply that I know that jumping on the traditional “New Year’s resolution bandwagon” doesn’t work for me. It is too much pressure. As I explain in the article I mention above, the holidays have taken their toll. I need to regroup, not embark on any kind of improvement course. I am not physically and mentally ready to make and stick with any “to do” list of changes. And the key here is the phrase “stick with”. For me, that is the most important part of making any resolution. Creating a list of what you want to work on is the easy part. It is the follow through that requires the most work. So, instead, I will be forgoing making any resolutions at the start of a new year ~ and I will not feel guilty about it. I will opt instead to simply be satisfied to get back in the swing of things after my holiday break. There is plenty of time in a month or two (or even more) to reassess. Please Pay it Forward and Share this! Thanks! Need Help to start or revamp your own business? You will find tips to help on our site, www.accessprofilesblog.com . Subscribe and you will receive one new article every couple weeks focused on You and Your Small Business! Let's Connect! Contact Us to find links to all our social sites! As we close out 2014 and make way for 2015, I think many of us like to reflect on everything that happened in the past year, both in our professional and personal lives. For me, that always includes my blog. What topics did I cover that generated the most interest? Was I able to reach a new audience? 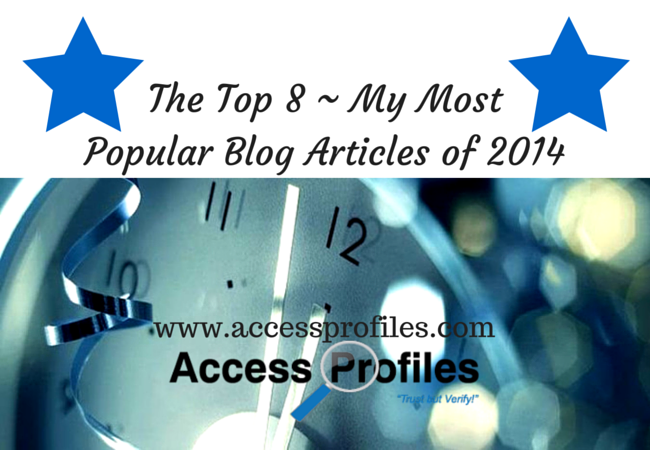 I discovered that these 8 articles were my most popular. They each found more readers, shares, and comments than other posts. The first of my articles to gain an audience in 2014 was “Why I Have Faith in the Millennial Generation”. The fact that my own children, and their friends, fall into this category was the reason behind the piece. My belief is that each generation brings with it a new perspective and strengths unique to them. Many agreed! By far, the most popular series I have written to date is my 5 part “Small Business Tips from People in the Know”. It features business tips from real small business owners on what works for them. The articles cover everything from setting up your business, hiring, social media, marketing, and more. Part 5: General Tips covering Customer Service, Managing Clients, Pricing, and more. These 2 articles also drew attention in 2014. The first was my article on getting your resume “background check ready” and the second was a recent piece on the “truth” behind the Background Check industry. 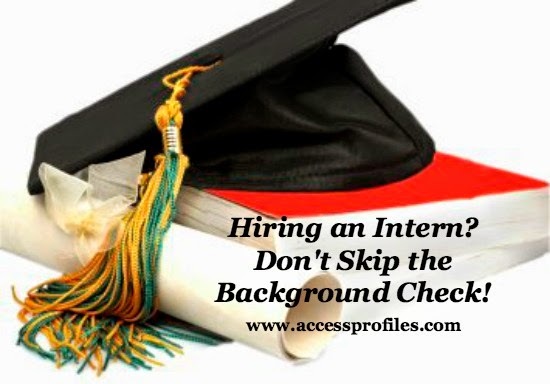 Both were designed to give you peace of mind when facing a pre-employment background check. My tips explain the best practices when it comes to your resume and what you can expect employers to look for. With many looking for jobs, or even hoping to advance their careers, having a resume that raises no “red flags” is key. My article on the importance of using convictions, not arrests, when screening an applicant also generated interest. In addition to many states adopting legislation on this, it makes sense that only those arrests which resulted in convictions should be considered. 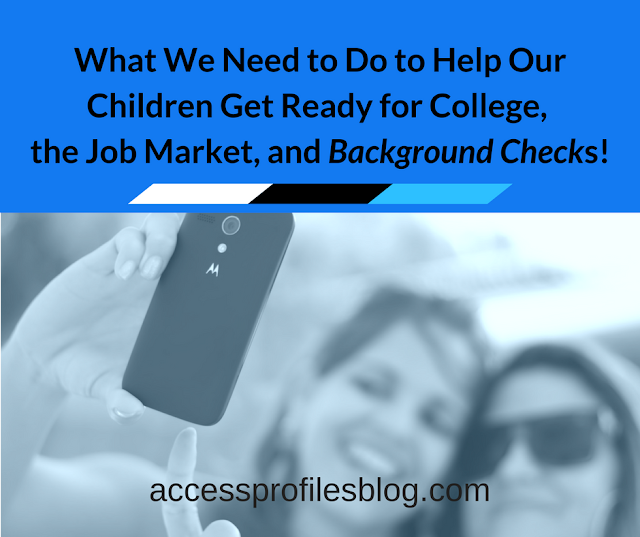 This is definitely an important topic in the background check industry. Internships were also in the news in 2014. The validity of not paying interns came into question when employers were finding themselves involved in litigation. The entire practice of using interns at all was debated. I believe in the importance of internships ~ both as a way for young professionals to gain experience and as a way to “pay it forward”. However, that does not mean you have to go into it blindly. That is why it is good practice to screen them just as you would any entry level employee. My article, “Hiring an Intern? Don’t Skip the Background Check!” explains. On a lighter note, my piece on “7 Super Easy, Free Apps & Sites Even ‘Technically Challenged’ People can Use” was also popular. In the past, I have often discussed my lack of “tech” savvy. I think there are others can identify. But these apps truly were easy to use and made me much more productive. Think things like Hootsuite, PicMonkey, Canva, and even Evernote. Finally, my most popular post for 2014 ....... “Small Businesses Need to Help Small Businesses ~ What You can Do!”. There is no doubt that the growth and interest in promoting small business is surging. We recognize that the strength of our communities, economy, and country relies on entrepreneurs. The fact is, there are many ways as individuals to help keep that momentum going. In my article, you will find tips on some easy things that you can do to help small business ~ and I think that is what made this my most read article! So that rounds out another year of blogging. Hard to believe that 2014 has come and gone, but I look forward to finding new and interesting topics to share in 2015! If you have any small business, hiring, or women in business topics you would like to see covered, please let me know. Or if you have any questions or problems concerning your own business, I would love to help! Thanks to you all for your support and continuing interest. I could never have done it without you! I invite you to subscribe to my blog at www.accessprofilesblog.com. What a great way to start the New Year! 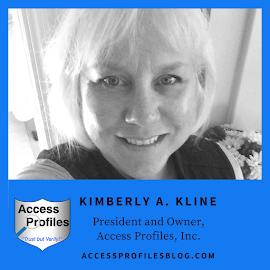 You will also find me on my website, www.accessprofiles.com, and on Facebook, Twitter, LinkedIn, and Google+!